​Folsom Kickboxing offers an array of workout and training activities. 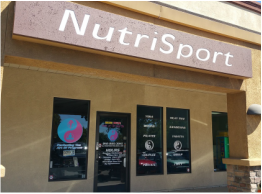 Nutri Sport is a new personal training and boxing class studio located in Folsom, CA. Classes include both cardio boxing and boxing classes with a focus on learning proper boxing technique. Personal Training and Yoga Classes are available by appointment. Join our gym for personal training sessions. Great classes to choose from. Increase your strength and endurance with a great cardio workout. Boxing Classes teach basic technique. Provide a strength and cardio workout. "I've been working with Joe at NutriSport since mid July '14, and I've had an awesome time. His extensive knowledge of the arts has pushed me far beyond what I thought I was capable of. Not only does he know a lot, but he really does take the time and pays major attention to the small details. I would 100% recommend going to see Joe to anyone!" I have been a customer of Joe's for over a year now and I could not be more happy with the results that he has pushed me to achieve! He is very easy to talk to and get along with! Joe is a well rounded trainer and has a solid background in Kickboxing. I am constantly seeing results both mentally and physically because of the attention to detail that Joe provides with every workout. Looking forward to many more sessions!